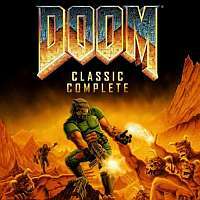 This new Doom II expansion set was developed for the release of Doom II on the XBLA & Doom Classic Complete for PlayStation Network. It was also included in Doom 3 BFG as a part of the additional bonus release of Doom II on it. The plot continues on Earth after Hell's forces have [seemingly] been vanquished. The goal of the expansion is to travel to a pocket dimension of Hell and assassinate a Cyberdemon that has been building an army of demons for his own personal use. It takes advantage of the expanded capacity of modern systems, with significantly more enemies on-screen at the same time than in the original Doom 2, especially in the later levels. The episode consists of nine levels in all, eight standard levels and a single secret level, as a homage to the similarly structured nine-map episodes in the original Doom, particularly Knee-Deep in the Dead. The new maps are a separate selectable campaign at the inception of the game, in a fashion similar to Doom's episode selection. Completing it in singleplayer on any difficulty unlocks the "And Back Again" Achievement, and unlocks the "Doom II Marine Suit" Avatar award.